What Makes Comsphere Infosat Industry’s Most Trusted Network? Infosat’s Comsphere network is the communication backbone for remote business. Drawing on the worldwide reach of multiple satellites in low, medium and geosynchronous orbits, Comsphere delivers data, voice and Internet services virtually anywhere on earth. Compshere supports more equipment sensors, data points, phone systems, video feeds, IT links and bandwidth than any other satellite service. Comsphere is industry’s most trusted satellite network. How did we win the trust of major corporations with the most stringent standards for signal availability, support and security? We earned it through decades of reliable service, unrivalled engineering expertise, and an unrelenting commitment to network integrity. To us, our network is more than just a conduit for ones and zeros. It is the communications platform for our clients’ businesses. Millions of dollars worth of economic enterprise depends on our Comsphere network every day. It’s a responsibility that we take very seriously. We take all possible measures to ensure network reliability. We refuse to cut corners. Our engineering team, which is the largest and most experienced in the industry, sweats every detail. We scrutinize every server, antenna, data relay and string of code that touches our network. Before we introduce any new piece of hardware we test it, retest it and then test it again. A network is only as strong as its weakest link. We probe, evaluate and reinforce every link and then duplicate it. When it comes to reliability, redundancy is a virtue and our modus operandi. Clients who visit Infosat’s teleport facilities are consistently amazed at the extensive security measures and the proliferation of parallel and backup systems. Every component is supported by at least one and often multiple backup systems. Our engineers constantly ask what would happen if a particular switch or router failed and then take preemptive corrective measures. Whenever there is even a minor malfunction we thoroughly dissect and analyze the problem. We don’t just fix the symptom, we solve the underlying cause. No other satellite service provider comes close to Infosat’s level of engineering vigilance. Some of our low-price-point competitors are content to operate systems with single points of failure. To us the practice is deplorable. Our clients’ business operations are far too important to expose them to such flagrant and unnecessary risk. We are fanatical about maximizing network reliability. Our clients’ remote facilities and the safety of their workers depend on it. The companies that truly value their data and insist on maximizing productivity at their remote sites choose Infosat. What satellite service provider will you choose? 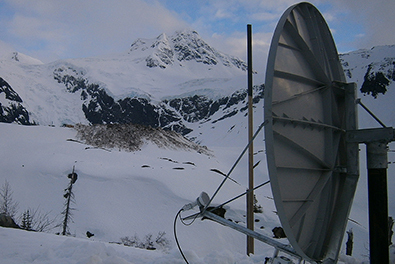 Satellite communications are vital to the productivity of your remote operations. Should you just choose the vendor who says they can get the job done and offers the lowest price? What due diligence factors should you consider? Small details make a big difference in satellite. Look for the most technically competent company. Infosat has the largest engineering team and more man-years of satellite expertise than all of our competitors combined. Make sure you have a service with the capacity to help your business advance. Beware of middleman resellers with limited bandwidth resources that can stymie your growth. Infosat can immediately provide you with additional bandwidth, because our parent company actually owns the fleet of satellites that we use. Significant financial resources are needed to provide the highest levels of data security, signal reliability and support. Are you willing to take the risk of dealing with a startup or struggling independent operating on a shoestring budget? By choosing Infosat you will be served by the industry’s largest, most experienced and financially solid corporation. Infosat is a wholly owned subsidiary of Telesat Holdings Inc., a private corporation with annual revenues in excess of $800 million. What satellite service provider will you trust?